Australia’s newest interlocutor for strategic policy in the White House is Michael T. Flynn, the retired US Army lieutenant general who is expected to be Donald Trump’s National Security Adviser. In his 2016 book, The Field of Fight, co-authored with Michael Ledeen, Flynn calls for a resumption of US war on the ground in the Middle East to defeat ‘radical Islam’. Would Australia join such a war? The authors see renewed war as an essential move to squash the global alliance that has come together to destroy America. That alliance includes, they say on page 76, not only Hezbollah, Islamic State and al-Qaeda, but also Russia, China, North Korea, Iran, Syria, Cuba, Bolivia, Venezuela and Nicaragua. The authors suggest that Putin’s government doesn’t understand that it’s aiding and abetting radical Islam. They say that the incoherence of Russia’s counter-terrorist strategy helps jihadis spread radical Islam throughout the country and beyond. The book argues against the view that peace is the normal condition of mankind. It says that the Powell doctrine, which holds that the US should only go to war if there’s a domestic consensus in favour of it, is backwards. What counts, the authors say, is what the public thinks at the end of the war. Their war plan is premised on the destruction of jihadi armies and killing or capturing their leaders. The authors contend that current US policy of targeted assassination over a protracted time, supported by intermittent military interventions, isn’t helping. The only possible conclusion from the Flynn and Ledeen book is that US armies should return to the Middle East. Those new policies would require a change in US diplomacy. The authors say the country needs a new set of 21st century alliances which ‘will emerge naturally from the military and political campaign’ of the new war. As for those governments that ‘support our enemies’, the US strategy must be ‘weakening them at a minimum, bringing them down wherever possible’. The war won’t be easy or short, and the country needs to mobilise as it did in the Cold War and in the Second World war against other messianic movements. Just what that set of views might mean for Australia in practice is far from clear. It’s hard to imagine that Flynn will have any influence among current senior leaders in the Pentagon or in a State Department led by a more sober-minded person, such as Mitt Romney. Flynn says himself that he has been a maverick most of his life. Both Flynn and his co-author have been branded as conspiracy theorists, with Ledeen arguing previously that Western European countries were in alliance with radical Islam to bring America down. Flynn’s appointment as Director of the Defence Intelligence Agency was terminated by the Obama administration after two years in the job. It would be almost impossible for the US to resume ground force operations in the Middle East to destroy all jihadi forces, spread as they are across many countries, so the more extreme parts of the Flynn vision for a new war are likely to remain his fantasy. Australia won’t be asked for new ground force contributions to the Middle East on any scale under a Trump administration. But Flynn has left open the door for a new Cold War against the governments that don’t crack down hard on radical Islamists. That’s the worrying part. How will the new US administration define the adherents of ‘radical Islam’? Flynn has specifically named Pakistan as soft on the ‘ideology’. For such countries, Flynn advocates a hard line, while saying they shouldn’t be punished twice, once by the extremists and then with a follow-up from the US. The book praises Singapore for insisting on secularism, and holds banning headscarves up as a positive move. The book calls for a full-frontal assault to demolish the ‘political and theological underpinnings’ of ‘Radical Islamic terrorists’. It’s hard to argue with that, but who does he include in the definition of ‘terrorist’? 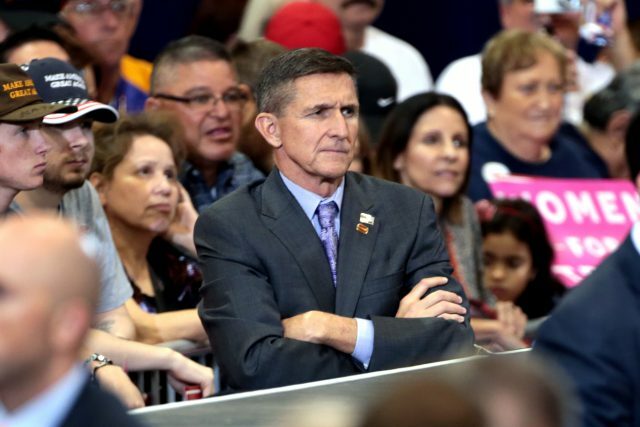 In a recent article , Flynn included among such vile criminals the Turkish spiritual leader, Fetullah Gülen, whom Turkey’s President has also labelled a terrorist. Flynn wants the US to grant Turkey’s request for extradition of Gülen for his alleged leadership of a plot to overthrow the Turkish state by force. There’s little public evidence, if any, supporting the Turkish claim that Gülen is a terrorist. In fact, there’s much evidence to the contrary. So if Michael Flynn survives in his post in the White House for more than few months, and I believe that he may not, he’s likely to become marginalised for his histrionic views. Apart from all of the domestic voices already organised against Flynn, and those emerging, many US allies will find themselves quietly calling for him to step down. Flynn’s obsession with a full-on confrontation against ‘radical Islam’ is problematic. It’s not the same as fighting terrorists and armed groups like Islamic State. Flynn has sometimes said that Islam isn’t a religion, but a political ideology. Acting in any way on Flynn’s jaundiced view of ‘radical Islam’ and its alleged non-Muslim supporters, stretching from Nicaragua to Russia and China, is a course that most US allies will find as unprincipled as it is impractical. Greg Austin is a professor in the Australian Centre for Cyber Security. Image courtesy of Wikimedia Commons.